NASA’s “deep space human exploration spacecraft,” Orion, has a test flight scheduled for 7:05 a.m. EST on Thursday from Kennedy Space Center, in Florida. Luckily, we have the live stream link HERE for those interested in watching Orion’s first trip into outer space. 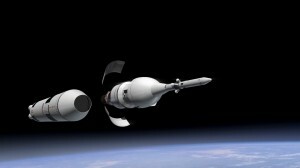 Orion can seat up to four people but its first few missions will involve traveling to an asteroid, before embarking on its ultimate goal of eventually shuttling astronauts to Mars. Thursday’s test flight will be unmanned to ensure no human gets hurt on Orion’s first journey to space should something go awry. Ultimately, the main goal of Thursday’s trial run is to study the condition of Orion’s cabin for astronauts when their turn comes to climb aboard the spacecraft. The capsule will experience severe temperatures and high radiation during the test flight while also testing the performance of its heat shield and 11 parachutes.